This is a remarkably large and lavishly illuminated Book of Hours, combining French and English styles. The first leaf contains a list of obits members of the royal family and of the 4th, 5th, and 6th Earls of Ormond and their wives, so it was probably made for Anne Boleyn's grandfather, Thomas Butler (1426-1515), 7th Earl of Ormond, or a member of his family. It was given in the early 16th century to a chapel at 'Suthwyke', probably Southwick in Hampshire. 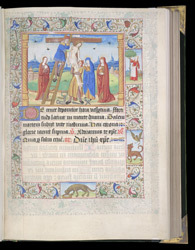 This is the third time that the Visitation has been depicted in this manuscript. Here it accompanies the text of the 'Magnificat' ('My soul doth magnify the Lord . . .; Luke 1:46-55'), said by the Virgin Mary when she discovered that she was pregnant.